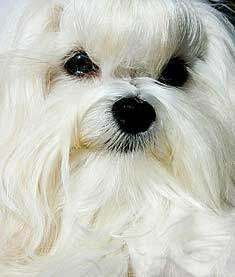 The Maltese has a compact and petite body with a white silky coat. 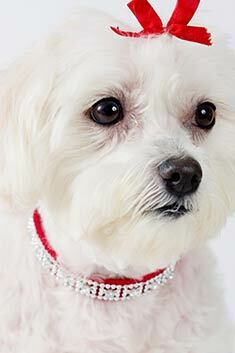 Gentle and affectionate, the Maltese makes an excellent companion. Well-built, with a jaunty, flowing gait that makes it appear almost to float as it moves. Alert and intelligent, this dog breed is easy to train. The Maltese originated in Malta. Malteses range from 7 inches to 10 inches. Malteses range from 4 to 7 pounds. Malteses are typically white, but beige and lemon markings are permissible. Malteses have silky coats that must be brushed every day. The coat must be kept dry in order to prevent matting. The Maltese is a gentle and sweet breed, but may be reserved with strangers. This dog breed does not accept roughhousing and as a result may not tolerate small children or other pets. The Maltese is susceptible to eye problems and patellar luxation. The expected life span of the Maltese is 12-14 years. Malteses are excellent apartment dogs. A walk each day will provide ample exercise for this quiet breed. Providing that they could exercise the Maltese, the elderly and the disabled make good owners. The Maltese is in the Toy group. Maltese need love and affection. Can Elizabeth Taylor, Frank Sinatra, Halle Berry, Heather Locklear, Marie Antoinette, and Mary Queen of Scots all be wrong? All of these people have lived with “Ye Ancient Dogge of Malta” at one time or another. Not a bad recommendation for this dog, also known as the “Roman Ladies’ Dog”, the “Majestic Creature,” and the “Comforter Dog”. All of these rich and famous people have found out that Maltese are happy, smart dogs that are relatively easy to train. The Maltese was bred to be a companion dog, and therefore they crave your love and attention. They would not be a great dog for those who work all day, leaving the dog home alone. However, this dog does do well in small yards and apartments because they like small, enclosed spaces. 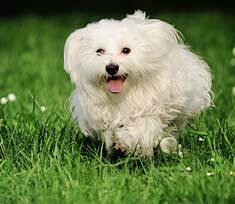 With their high energy level, Maltese do best when walked daily. This toy breed should weigh no more than seven pounds, but the Maltese knows no fear, so he will socialize easily with other dogs, regardless of the other dog’s size. The breed is often willing to play with cats, as well as dogs. In fact, most Maltese prefer chasing a moving object to playing with tug toys or chew toys. A Maltese in full show coat. A typical Maltese is usually 7 – 9 inches tall, with a body just a bit longer than its height. His fur grows to over 8 inches, hanging straight to the ground, and may be white, off-white, or very light golden brown. This dog looks pretty much like the dust mop your grandmother used on her hardwood floors. The fur of an adult is straight, but puppies may have waves or curls. There is no undercoat. His fluffy tail has long hair and curves up gracefully over the back. The long hair that hangs in front of his eyes is generally pulled up into one or two topknots. In order to prevent the fur from becoming matted, regular grooming is required if the fur is kept long. People who don’t show their Maltese often keep the coat clipped in a 1 – 2 inch “puppy cut”. Show dogs often spend their “off” hours with their hair sectioned and wrapped to keep it from matting and breaking. They often resemble a housewife in curlers during their non-show time! 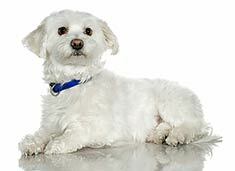 The good news is that the Maltese rarely sheds and is considered one of the hypoallergenic breeds, like its cousins the Poodle and the Bichon Frisé. Although no dog is truly non-allergenic, the Maltese is generally bathed and groomed so often as to reduce the severity of allergic reactions generated in his family. Keep in mind that allergic reactions come from the dead skin cells that flake off of a dog, as well as from the secretions from his salivary and sebaceous (oil) glands. Therefore, even a hairless dog can trigger allergies. 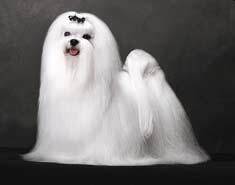 With their extremely long hair, Maltese are generally bathed and groomed at least once a week, washing away the dead skin flakes and secretions before they become too much of a problem. The very dark, expressive eyes are surrounded by a “halo” or dark rim. Many Maltese produce more tears than the normal dog, resulting in tear staining of the hair around the eyes. The amount of tears your dog will have depends to some extent on genetics and to some extent on environmental factors and stress. Some feel the tears are a low-grade allergic or infectious reaction and should be treated with oral antibiotics or eye medication. Others say it is simply something white dogs deal with and should be left alone. Maltese eyes are prone to tearing. Tear staining cannot be totally prevented, but serving a brand of food that doesn’t contain any food coloring and washing your dog’s face after meals, can minimize it. Also, some veterinarians recommend distilled or bottled water to reduce tears. To remove the stains, a fine-tooth metal comb should be moistened with lukewarm water and drawn gently through the stained fur. Doing this every two to three days will keep the sticky stains from becoming too prominent. Noses may range from pink to black, with sun exposure encouraging the black color to develop. The pink nose is often called a “winter nose” because it appears during periods of lesser sunlight. One of the most common health problems for Maltese is bad teeth. They often begin to lose their teeth by the age of 8 or 9, and end up gumming their food for the remainder of their 13 – 15 years. This problem can be avoided by brushing your dog’s teeth each day, particularly as he gets older. You may have better luck with the dog accepting this activity if you start as a puppy, when he is less set in his ways. Make sure to use dog toothpaste, not the stuff you use, as your dog doesn’t know not to swallow it. If you are having trouble getting your Maltese to accept getting his teeth brushed, try this trick. Place a small amount of soft dog food on your finger and rub it gently against his teeth. Next, replace or mix the dog food with canine toothpaste. Once he is comfortable with this, put some of the dog food on a small-bristle toothbrush, then gradually switch to canine toothpaste. The Maltese has drop-ears with excessive hair around them. In addition, frequent bathing can leave the ears moist enough to encourage the growth of bacteria or fungus. For this reason, his ears should be checked on a weekly basis for signs of an infection. These signs might include a strong odor, whining when the ears are touched, heavy wax build-up, and shaking of the head. If your dog shows these symptoms, you will need to see the vet. Many ear problems can be cared for at home, however. One important preventive step is to remove the hair that is growing in your dog’s ear canal. You are not concerned with the hair that is growing on the floppy part of the ear, but only that which is growing in the canal leading to the ear drum. Simply coat your fingers in baking soda, then pull out the offending hairs. This is not painful for the dog, and will allow more air circulation in and around the ear canal to dry the moisture that can lead to infections. Maltese are happy and energetic. If your dog’s ears are filled with a dark, waxy substance, it is likely that he has ear mites. Use a cotton ball coated in hydrogen peroxide or rubbing alcohol to remove the debris from your dog’s ear. Using cotton swabs will simply push the debris further into the ear canal, so avoid those. You can reach fairly deeply into the dog’s ear canal without damaging the eardrum, as the ear canal turns at a 90-degree angle before the drum. With a cotton ball over your finger, put your finger in the ear canal and twist it back and forth. When the cotton becomes soiled, get another one. Repeat until the ball comes out clean. As you have seen, the Maltese could be considered a high-maintenance dog, but they are so cute, it’s hard to refuse to bring one home! Before you adopt, you owe it to yourself and to your dog to consider carefully whether or not you have the time to devote to grooming and exercising your dog on a regular basis. Don’t be one of those people who adopt a cute puppy, then send it to a shelter when they realize how much work is entailed. You must make the commitment for the long haul, but you will be richly rewarded with the love of a wonderful companion. Find Maltese Puppies with our Free Breeder search!